As a mom, I have 100s, if not more, photos of my children. I really do treasure each one of them, but unfortunately, pictures don't last forever. They fade, can get ripped, etc. But...what if you could make a photo that does last forever (or at least a very long time)? How great would that be?! Well, Aluminyze can do that for you! 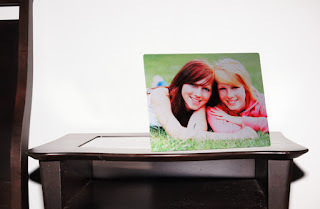 With Aluminyze, your photo is actually infused into a sheet of aluminum. This technology gives your photo exceptional image quality and makes it extremely durable. It also gives a regular photo a three-dimensional look! Another great feature is that these don't need to be framed and can be displayed practically anywhere. There are several different sizes, surfaces and finishes to choose from, giving you complete control over the look you want. Click here to visit the site to see all the different design options and pricing. I would also suggest following Aluminyze on Facebook and Twitter. They hold weekly contests and run promotions from time to time that you wouldn't want to miss! The first thing I noticed of course was the packaging. Now, a piece of hard aluminum has to go through a lot to get damaged, but they really packed it up nicely to ensure it arrived in perfect condition. When I opened it, I was surprised at how shiny it was! The example photos on the site don't show this at all, but it was a very nice effect. I took it out and couldn't believe how lightweight it was, yet was very sturdy and durable. I can't see how this photo would ever get destroyed. I couldn't bend it at all, and I tried! I turned it over and it is indeed, a piece of aluminum. It looks and sounds like it. I was happy to see a built-in easel for display on the back. I simply had to pull it up a little bit and it stood up perfectly. I am very happy with my Aluminyzed photo in all aspects except for the fact that it is quite reflective. As you can see in the photos, you can practically see a mirror image of everything. However, there is a fix for this. Just choose the matte finish instead of glossy when you order to reduce this glare. I now keep the photo in a downstairs den with no natural sunlight and there is no glare whatsoever on it and it looks great! Aluminyze is allowing me to give away an 11x14 Aluminyzed photo with an upgraded photo mount of choice! This is valued at $44.95 not including the fixture upgrade. This would make a great Mother's Day gift! All entries are optional...do as few or as many as you like! Giveaway ends 4/11/12 at 12:01am EST. GOOD LUCK!